Antonin Dvorak's New World Symphony is one of the most popular classical works ever. In this spirited account of the story behind the composition, Joseph Horowitz brings to life the diverse musical and cultural influences that inspired the composer, who came from Czechoslovakia to America in 1892. Listening to his assistant, Henry Burleigh, sing slave songs, and visiting Wild West shows and the Kickapoo Medicine Show gave Dvorak the raw material from which to compose his masterpiece that, to both popular audiences and critics, captures the vibrancy and power of American music. Illustrated with archival black-and-white photos, and including index and source notes for further research, this book brings the dramatic and inspiring story of a musical masterpiece to life for young readers. The fundamental irony that America needed the prompting of a white European to take its own indigenous music seriously has left itself open to a wide variety of readings over the years. 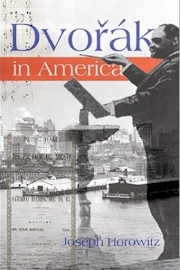 For Joseph Horowitz, a critic and scholar of American music and more recently a prominent consultant to US orchestras, Dvork’s trip to America in the 1890s has become prime fodder for a broad multidisciplinary curriculum of American studies. Horowitz has spent much time with this material over the years. For the Brooklyn Philharmonic Orchestra he fashioned an audience-friendly festival out of current Dvork scholarship in the early 1990s (most notably that of Michael Beckerman) to mark the centenary of the New World Symphony, and later took the Dvork story into Brooklyn classrooms. Now, in conjunction with programming initiatives inspired by the centenary of Dvork’s death in 2004 (including a forthcoming interactive DVD by Robert Winter and Peter Bogdanoff entitled, From the New World: A Celebrated Composer’s American Odyssey) Horowitz returns to Dvork in this concise and informative account for young readers. Both on the page and the stage Horowitz is a formidable presence whose ideology is hard to miss. At the root of his work, particularly his previous accounts of Toscanini and the early Wagner movement in the US, is his take-no-prisoners belief that American culture has been crippled by the New World’s unreflexive worship of Europe. In this case, however, Horowitz wears his learning lightly, pitching his account of Dvork to an age group looking for a good story with little patience for ideology. Even before the great composer reaches New York, we’re introduced to Harry Burleigh, the young assistant who would become his guide to the slave songs that helped shape his impressions of America. Once Dvork takes control of the National Conservatory of Music, the reader gets caught up in his social circle with the likes of conductor Anton Seidl and critic James Gibbons Huneker. We even accompany Dvork on an 1890s tour of America, from Buffalo Bill’s Wild West Show to the Czech immigrant community in Spillville, Iowa. While some of the book is in Dvork’s own words, taken from letters and journals reprinted either in whole or in part, much of Horowitz’s account relies on what he calls in his postscript ‘interpreting’ the written ‘score’. In truth, much of the book relies on a restrained use of fiction-writing techniques, such as taking a few documented events and filling in a few lines of dialogue. In the larger scheme, however, what holds this account together is a novelistic ability to show rather than tell. With minimal authorial intrusion, Horowitz gets into the heads of his characters and lets them make most of the discoveries themselves. While the setting may be particularly American, the sentiments behind it – particularly that of temporary displacement and the need to find a new context – are rather universal. Horowitz has a gift for relating that condition smoothly in vocabulary that most 15-year-olds can easily grasp (he credits his son Bernie as his ‘guinea pig’). But beyond that, he shows a deep familiarity with his material, painting huge tapestries with a minimum of well-chosen words, that more writers for grownups would do well to emulate.